Manipur has earned the reputation of being the cradle of Indian sports, giving the country a reason to celebrate time and again. Even before the Manipur Olympic Association was set up in 1977, sport was a way of life and a common passion that united the people of the state. And following in the footsteps of Pangambam Nilakomal Singh, the India hockey goalkeeper at the 1984 Olympics, Manipuris have carved out a niche in a number of disciplines. While driving from the Imphal International Airport to the centre of town, it’s hard to miss the action unfolding on the fields along the way. There’s a good chance it’s a game of football, unarguably the most popular sport in the state these days. The perimeter is packed with fans of all shapes and sizes, engrossed in their favourite recreational pastime. Sport is so deeply ingrained in Manipuri culture that even the chief minister, Nongthombam Biren Singh, is a former footballer who played for the victorious Border Security Force team during the 1981 Durand Cup. But it is the women who form the backbone of society in a state where life has regularly been stirred by violence and strife. In their 2010 book, The History and Culture of Manipur, Saroj N. Arambam Parratt and John Parratt write: ‘The high social and economic status of women in Meitei society [the majority ethnic group in Manipur] was frequently remarked upon by British colonial officers. Despite the dominance of Hinduism in the plains of Manipur, Meitei women suffered none of the humiliating oppression of their sisters elsewhere on the sub-continent. Above all the women controlled the food supplies and the markets, and were therefore a dominant economic force’. The exploits of Manipuri women range from the First Nupi Lal or Women’s War in 1904 against the British to the protest in February this year, when they stayed out all night in the cold to take a stand against the Citizenship Bill. Women have claimed their equal place among the men not only in various spheres of daily life but on the sports field as well. It makes sense then that Manipur’s most famous export is a woman — MC Mary Kom — an Olympic medalist in 2012, the most successful boxer in India, winner of a record sixth World Championship gold medal at 36 years of age last year and a mother of three. And there are other inspirational ladies such as weightlifter Nampeirakpam Kunjarani Devi and former captain of the national football team, Oinam Bembem Devi — role models for young women who dream of treading the same path as their illustrious predecessors. What unites them are their humble backstories, a relentless work ethic and the desire to find their place among the best. At the insistence of a friend, she had decided to pay a visit to Kongba Boxing Academy when she was 10. This was at a time when MC Mary Kom and Laishram Sarita Devi were making a name for themselves with their moves in the ring. “I was interested in many sports and even won medals at school. But I didn’t ever think of playing professionally. My parents’ meagre income from farming meant we never quite had enough resources, even though we were surrounded by sports,” recalls Samjetsabam Sarjubala Devi. While warming up on the first day at the academy, she was in awe of the gritty boxers sweating it out. Within a few weeks, Sarjubala herself would don gloves for her first sparring session. And she would be thrilled by that experience. She laughs and says, “Of course I felt the pain, but it was a great feeling anyway”. Her parents had little idea about what their daughter was pursuing; during those early days, it was a cousin who egged her on. In December 2004, Sarjubala heard of a talent hunt at the Sports Authority of India (SAI) North-East Regional Centre in Imphal and decided to try out. Though small in stature her hunger showed, and she was picked for a training programme. For the next nine years, Sarjubala cycled for 15 minutes from Wangkhei to SAI every morning. “They supervised the training. It was up to me to put in the hard work to get better and help improve my family’s condition. We eat a lot of sticky rice and fish at home, which I later learnt is the perfect diet to supplement boxing,” she says. At the sub-junior nationals in Punjab in 2006, Sarjubala picked up her first gold medal and followed it up with another at the same tournament a couple of years later. But even as she was finding her feet in the ring, her world was rocked by events back at home. In 2009, her brother, S. H. Rakesh Singh, had an accident that left him in a coma, and all the medical responsibilities fell on Sarjubala’s shoulders. 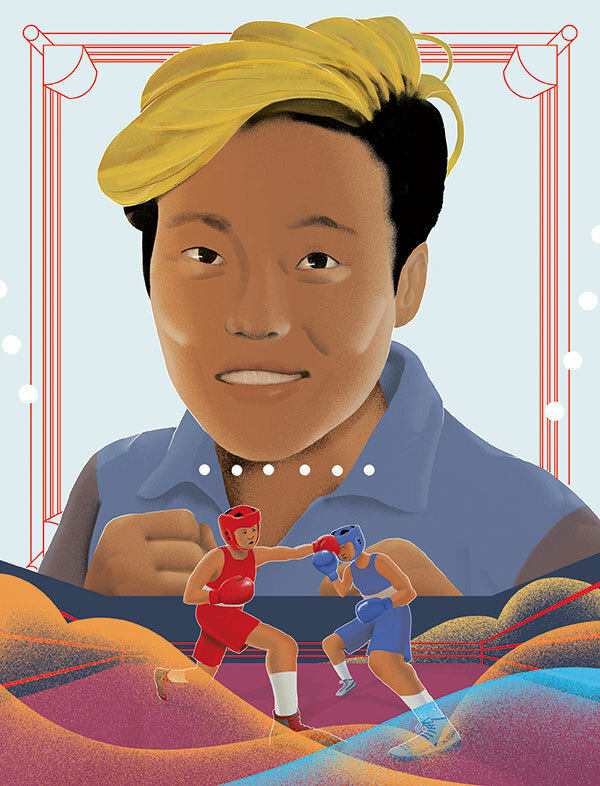 The following year, she came home with the gold as well as the Best Boxer award at the nationals, but was shaken by the news of her sister S. H. Sunibala Devi’s suicide. “It was difficult to focus on boxing; yet, that’s what was required of me at the time,” Sarjubala says. The fight was real, both inside and outside the ring, and there was no stopping Sarjubala. In 2011, she showed her resolve by picking up a gold medal at the AIBA Youth Women’s World Championship in Antalya, Turkey, followed by another national champion title that year. Her feats drew the attention of Olympic Gold Quest, a not-for-profit foundation which has been supporting her ever since. It was a much-needed respite from all that she had endured. “I can never forget that year. People began to know who I was and it felt really good to earn their respect,” she says. The 48-kg category, however, came with its fair share of obstacles, because MC Mary Kom also fought in the same weight division. And it is something that Sarjubala has learned to take in her stride, ever since first sparring with her idol. “She’s a great fighter and so successful. I know it’s always going to be difficult. But we’ve had healthy sparring sessions at camp,” she says. “To be honest, I never thought that there would be a day when I would find Mary didi in the opposite corner,” she adds. While Sarjubala continued winning domestic competitions, two major triumphs came at the AIBA Women’s World Championships in Jeju City, South Korea (silver in 2014) and the President’s Cup in Palembang, Indonesia (gold in 2015). Though disappointments followed at the Rio Olympics and 2018 Commonwealth Games, she bounced back with the gold and the Best Boxer award at the nationals last year. “What was important was the fact that it was my first win after switching to the 51-kg category, which is where I hope to contest at the 2020 Olympics. Switching weight categories is never easy because it requires tremendous planning and execution. So it’s good to see the payoff,” she says. These days, she’s nursing a shoulder injury from the Asian Games last year, which gives her some time to indulge in her favourite activity outside of boxing. “Shopping for me is therapeutic,” she chuckles. Whenever Sarjubala meets youngsters who dream of boxing at the highest level just like her, she makes it a point to have a little chat with them. “I always tell them that support will be hard to come by initially; they will have to train hard if they want to become champions. It’s all in the head,” she says.